W. W. Norton & Company, 9780393340730, 123pp. How negotiable is a fact? 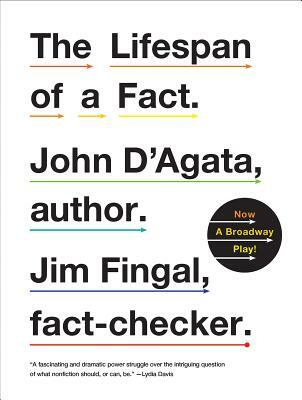 In 2003, after publishing his book of experimental essays, Halls of Fame, John D'Agata was approached by Harper's magazine to write an essay for them, one that was eventually rejected due to disagreements related to its fact checking. That essay which eventually became the foundation of D'Agata's critically acclaimed About a Mountain was accepted by another magazine, the Believer, but not before they handed it to their own fact-checker, Jim Fingal. What resulted from that assignment, and beyond the essay's eventual publication in the magazine, was seven years of arguments, negotiations, and revisions as D'Agata and Fingal struggled to navigate the boundaries of literary nonfiction. This book includes an early draft of D'Agata's essay, along with D'Agata and Fingal's extensive discussion around the text. What emerges is a brilliant and eye-opening meditation on the relationship between "truth" and "accuracy" and a penetrating conversation about whether it is appropriate for a writer to substitute one for the other.